On the arm of Garrett Stallings, Tennessee defeated No. 2 Georgia 3-0 on Friday night to clinch a series win. Stallings threw a complete game shutout as he struck out five, allowed five hits, and gave up just one walk. With the win, the junior right-hander is now 6-2 on the season with a 1.64 ERA. Stallings didn’t allow a single Georgia baserunner to reach third base. 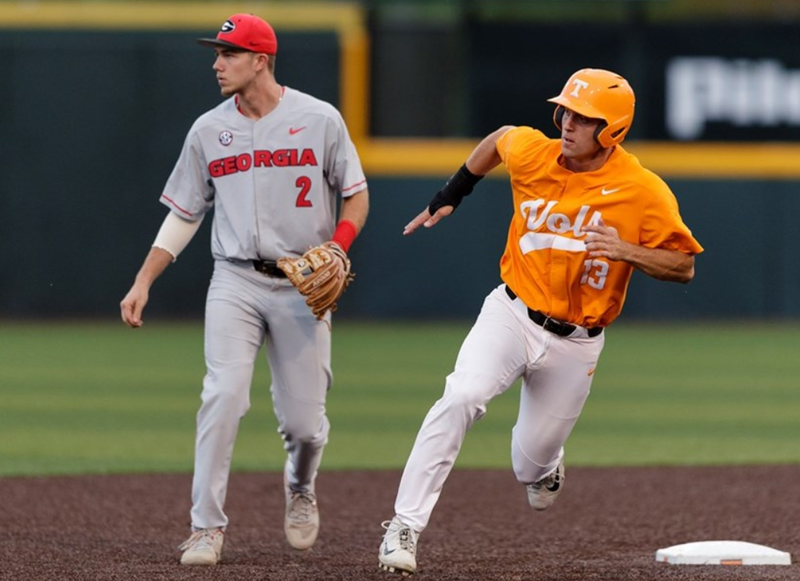 The Chesapeake, Virginia native cruised through the first six innings, and once Tennessee (26-10, 6-8 SEC) claimed a 3-0 lead in the bottom of the sixth, he turned the heat up on Georgia (28-8, 9-5 SEC). Over the last three innings, Stallings allowed one hit — which came in the top of the seventh inning. He promptly induced a ground ball to Andre Lipcius at third that resulted in an inning-ending 5-4-3 double play. In the eighth inning, Stallings shut down the Bulldogs in order by way of a strikeout and two fly-balls. There was no doubt that the veteran had earned a trip back out to the mound in the ninth to put the game away. “I’m just trying not to do much,” Stallings said. “Just go right at em’, and with a three-run lead, it changes the philosophy. Stallings’ complete game shutout was the first of his career. It’s the eighth time this season Tennessee has shutout an opponent, which leads all of college baseball. It was also the second-straight game the Vols shutout the No. 2 Bulldogs. “It was unbelievable,” Tennessee coach Tony Vitello said following the game. “I don’t really know how to describe it. Tennessee got on the board in the fourth inning when Andre Lipcius led off the inning with a walk. Al Soularie then hit a line drive off the left field wall to put runners on second and third with no outs. Justin Ammons continued the rally by hitting a sac fly to right field that gave the Vols an early 1-0 lead. In the bottom of the sixth, Tennessee would tack on two more runs. Zac Daniels led off the inning with a double, and the next batter, Lipcius, hit an RBI single to right field. After Soularie hit a single to advance Soularie to third, Ammons hit his second sac fly of the night to score Lipcius. The three runs would be all that Tennessee would push across, but it was just enough as Stallings retired the last seven batters he faced. CJ Smith (L, 3-2) received the start for the Bulldogs and lasted five innings. Smith allowed three runs on four hits and struck out three. Tennessee and Georgia will link up one more time on Saturday afternoon at 3 p.m. ET. The Vols are going for the sweep with RHP Zach Linginfelter (5-3, 3.45 ERA) on the mound. RHP Tony Locey (5-0, 2.18 ERA) is expected to start for Georgia.